Today, the Inter-African Coffee Organisation (IACO/OIAC) is headquartered on the third floor of the Ivorian governmental building of the CAISTAB. Created on December 7th 1960 by 11 African heads of State, IACO is one of the first ever inter-governmental organisations to be created in Africa. It represents millions of coffee growers on the continent, coffee being one of the main backbones of numerous economies of the continent. But it has a low visibility, making it difficult to play an active role in enhancing African coffee’s image. “This is why a headquarter of its own is drastically needed,” explains the Secretary General, Frederick Kawuma, to CommodAfrica. And after years of waiting, it seems to be on track. In addition, an African coffee fund is also being set up to finance coffee projects on a large scale. Also, third pillar of Dr. Kawuma's strategy: IACO is on the verge of integrating the African Union organisation and becoming its specialised unit on coffee which should give it more financial and political capacity to put forth Africa's coffee as world consumption is on the rise. “However, IACO is not looking at the AU as its source of finance, since we know that Commission already faces financial challenges of its own. Rather, IACO will leverage on different partnerships to finance the transformation of the African coffee industry”, says Frederick Kawuma. IACO wants to build a new image so as to give Africa coffee a boost. How do you go about doing that? When I arrived at the Inter-African Coffee Organization (IACO) in 2013 and found that the office had been in the building of the CAISTAB, at the Ministry of Agriculture of Côte d'Ivoire, for the last almost 40 years, I thought it was not appropriate for an organisation such as IACO not to have its own home. So, I asked the government of Côte d'Ivoire if we could have land so that we put up our own headquarters. It was a debate for quite a while until the decision was made at the Council of Minister on 1st July 2015 to give us the land, 6 000 m2. Soon, thereafter, we received the attestation to this effect from the Presidency of the Republic. With this achievement, we started reaching out to potential partners that could come alongside us to realise this project. First of all, I needed an architect who could work in designing the project. But I did not have the money! And the architects we approached wanted us to have the money upfront. Finally, one architect, a young man from Côte d'Ivoire, Cedric Kouassi, was keen. So, I shared the concept with him, and he came up with different permutations. We finally agreed on one and he proposed a design. 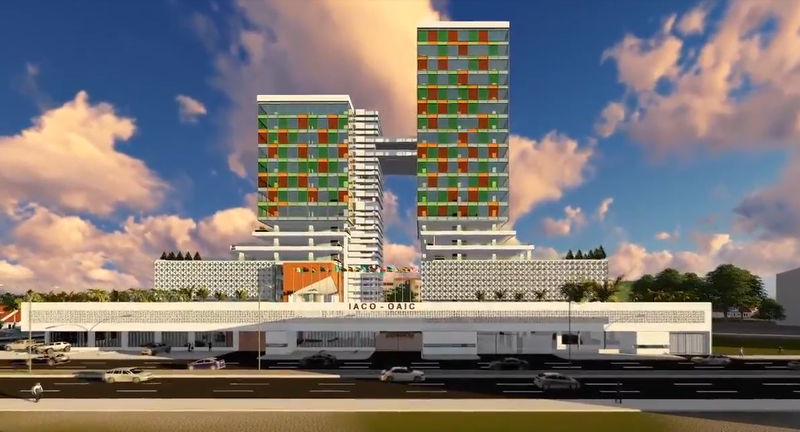 The concept was for a green-building: generating electricity from the abundant sunshine we have in Abidjan with the use of photovoltaic technology, re-use and purification of the water used in the building as well as recycling of all the waste generated. The project was presented to IACO’s annual general assembly in November 2015, held in Luanda, Angola, and was approved by the members. The concept that I had in the business plan was to find a partner with whom we would agree on a build-operate-transfer (BOT) arrangement to put up this building to house our headquarters on three floors, with the rest of the building being managed by the partner. The rent from the building would go into servicing the loan acquired by our partner. The building has two towers: one with 15 floors and the other of 20 floors. In the design, I wanted a conference centre with a main auditorium which sits 1800 people and a smaller one of 1300. There will be a commercial centre/shopping mall and the partners that we talked to are interested in converting one of the towers into a hotel. IACO would give a lease to the hotel operator. All the revenue coming in would go to servicing the loan that the partner is going to take up to finance this project. When you talk about a commercial centre, do you have in mind to have a shop which showcases and sells all of the coffees from Africa? It will be a shopping mall and we will try to attract companies to take up space there. Because it is an investment. Hopefully, we will have a company that will operate a coffee business that will provide coffee from different African coffee producing countries. So, the only thing you are still waiting for is the land title from the government of Côte d’Ivoire? Yes. And this certificate of the title of the land should be given to us soon. The architect has been spearheading a number of studies required for the construction permission because our partner wants us to take care of all these details. All of this is going to be in place very soon. Once that is done, then the rest of the process will continue and thereafter it will be the partner driving the process. We hope that ground breaking will happen later this year and by beginning of next year, construction should be well on the way. Why is it so important to have a building of your own? Just imagine: this is one of the oldest intergovernmental organisations in Africa, created in 1960, it represents an industry that was core to the economies of our African countries: coffee! And it has no home, no place, no visibility. So, it was critical for us to have this building so that it becomes the centre of African excellence for coffee. We will have a modern coffee laboratory that will be able to do all matters of coffee tests, people can send in coffee samples for analysis, every kind of analysis will be possible. Also, we will have a training centre for Africa. It will be, indeed, the African Coffee Centre of Excellence. Having a headquarter for the Organisation should be able to show to the rest of the world that this is where you can come and see the display of African coffees. You are also working on launching a coffee fund? Yes. The other vision I have had is creating a fund (the Africa Coffee Facility) that would support the development of the African coffee value chain. Again, it has been long in coming but finally we have concluded with the Afreximbank to support us in the process. They will house the Facility and also help us in the fund-raising and managing of the Facility. We have agreed to hold a donors' conference that will take place in September of this year in Nairobi, because the current chairman of IACO is the Minister of Agriculture of Kenya. His office is doing the coordination work to hold this conference. Once, the donors’ conference is concluded, and we have the indication of the level of commitment from all the different partners, we will finalise the business plan for the establishment of the African Coffee Facility. This Facility will address four key pillars. One is to build a sustainable regional coffee supply chain. We will start with the transformation of coffee production systems. Today, most of our production is through smallholder subsistence farmers. So, we want to build capacity of these farmers so that they can move from subsistence to more commercial orientation. We are looking into developing entrepreneurial skills and getting the farmers into organisations that are viable, that have good governance and can help move the industry forward: where there are no cooperatives, we will support the establishment of farmer cooperatives. Through these cooperatives, farmers will receive training, services and so on. The second pillar has to do with building demand, market linkages and investment. Key to this is the promotion of domestic consumption in Africa. We want to promote the transformation of the value chain in Africa, helping build the capacity of those who want to set up coffee shops, cafés, small roasteries, etc., and those producing coffee for the consumption of local markets in each of our member States. The third is looking into environmental sustainability: how do we get our coffee production systems to make the adaptation to climate change and all the associated challenges we face today? We aim to transform the practices we have today to be in line with what will conserve the environment. We will support research efforts in this regard, we will look at various options that help to build this capacity. The fourth pillar looks at information. Dissemination of information and communication of lessons-learned, sharing of experiences and tools, and building partnerships is more urgent now than ever. There is a lot of information that needs to be gathered and shared. Africa has a big problem of data collection. So, we want to focus on how we can improve our data collection and dissemination systems. Having this data helps the farmers and the consumer. In all of this, we have one key program that we want to serious attention to, which is the empowerment of women. Because we know that they are the key drivers in this sector in Africa. We know that agriculture employs 70% of the labour force in Africa and the majority of this are women. So, we will have several project ideas that will come from organisations that want to participate in this and will come up with proposals that will be funded in that area. We are also looking into the youth empowerment. How do we empower them, how do we help them engage in the coffee value chain ? So, one of the areas is to make the coffee industry attractive. There are various things that can be done. Today, we look at production but there is probably much more than that. So, we look at the young people interested in coffee as a business, we want to build capacity of young entrepreneurs in the coffee sector, we want to support research into alternative uses of coffee so that people can look at all the agribusiness options around coffee. For example, I talked to one young man in Rwanda who is producing coffee flavoured soap. This is interesting, it is an innovation. So, we want to encourage young people to come up with different innovations around coffee, and look at the entire value chain, from production through to final consumption. So, these are some of the things we are looking at and the African Coffee Facility will help us address the transformation of the African coffee value chain. What will be the financial amount of the Facility? Originally, we had come up with a figure of US$ 150 million and we said that this would just be to catalyse the whole process. But in discussing with Afreximbank, they told us that this amount was too little, that we will not be able to achieve much to see a real transformation. So we actually increased the figure substantially and we will be presenting this to our partners in Nairobi to see what the uptake would be. This Facility will be a 10-year program and we hope we can raise up to US$ 950 million to support the effort and then see how it can go further. In March 2018, the African heads of state signed an agreement to create the African Free Continental Trade Area (AfCFTA), which is expected to transform intra-African trade. We know that coffee will be one of the flagship agricultural products traded in the AfCFTA, and the Africa Coffee Facility will support the entrepreneurs who are aiming at selling coffee as a finished product. The impact of this will be transformational at the level of our smallholder producers for whom improved market access will lead to better livelihoods, and will be key in reducing rural poverty.